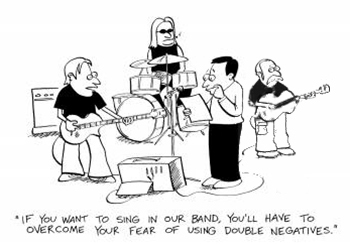 There’s no doubt about it: popular music makes double negatives seem normal and correct. Yet, English simply does not condone them. Most double negatives are obvious and easy to avoid. When there’s a “no” and a “not” hovering around the same clause, you know it’s a double negative problem. Slightly more subtle is the combination of a negative verb and a negative pronoun, as in: “I don’t want nothing.” Of course, you know that it’s correct to say “I don’t want anything” or “I want nothing”, but it’s not correct to say both in the same sentence. In fact, this subject is so easy and uncomplicated, that a user of double negatives must be doing it on purpose. It’s hard to imagine a person so lost in his syntax that he doesn’t know any better. Other languages deal with this problem differently. 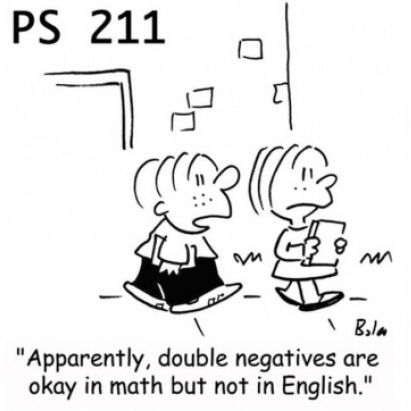 (Spanish, for example, not only accepts the double negative, but requires it.) English is uncompromising. Only one negative per clause, please!